The gentleman pictured above is my Great-grandfather. Henry was born in Aberargie, Abernethy Perthshire, Scotland, UK and he was a carpenter by trade. 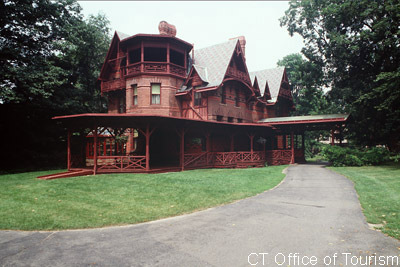 He immigrated to the United States circa 1870 and settled in Hartford, Connecticut. An interesting story concerning the Mark Twain House and Henry has been passed down through the generations and goes something like this. Henry and his crew reported very early in the morning to repair Mark Twain roof. Henry was busy driving nails, when Mr. Twain appeared at an upper level window and exclaimed in a loud voice. "Whose up there tap-tap-tapping!" Henry replied, "the carpenter". Soon after, Marks daughter appeared and shouted to Henry, "come down and sit under the shade tree until father is ready to rise for the day". Mark Twain considered his rest more important then paying Henry and the crew for their idle time.